Synonyms: High Kyuu!! x Nisekoi, Nisekoi x High Kyuu!! Nisekyuu!! was published in English by VIZ Media in their digital Weekly Shonen Jump anthology magazine on January 23, 2017. This one-shot was adorable. I just enjoyed it so much! Especially because I'm a fan of both Nisekoi and Haikyuu!! 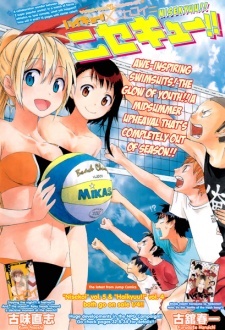 Beautiful and funny, I recommend to all the fan of Nisekoi and HQ to read it, it will make you happy. I don't know. haikyuu x nisekoi. weird idea. how did you come up with that? I don't know. they seem like totally different series. I'm just trying to stretch this review out now lol.